Legend has it that the Alps were the abode of dragons and that the villages below were cursed. That is not what drew me to the Alps a few weeks ago, but it certainly added to the mystery surrounding these mountains. Alpinism has become one of my favourite pastimes and how could I not make a pilgrimage to it's place of origin? It's no coincidence. 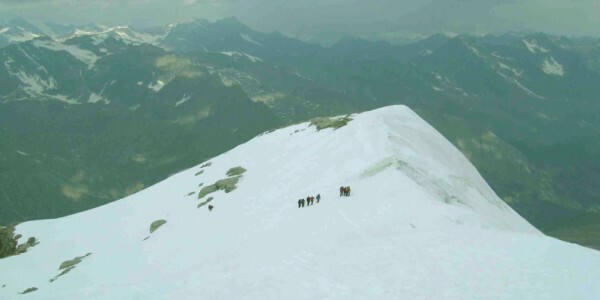 The term Alpinism is derived from the Alps. Several European countries comprise the Alps, and each one has it's alpine center. Chamonix in France, Zermatt in Switzerland and Courmayeur in Italy, to name a few. The Alps even extend all the way to Austria and Slovenia. I chose Chamonix as my base and decided to explore the Alps up close and personal. 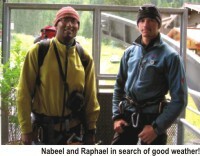 I was met in Chamonix by my guide Raphael. Raphael was 22 years old the youngest guide I've ever had.But he had passed the rigours of the French Mountaineering School which is recognised as one of the best in the world. I told Raphael I spoke a little bit of French and he suggested we speak that language. Hmmm… I wasn't sure that was such a great idea. In the mountains, even my English gets slurred, my French would surely be incomprehensible! I would be inviting disaster for sure. To say the trip was adventurous would be an understatement. On the way to Italy to climb Gran Paradiso, fumes started coming out of Raphael's car. Here was one situation mountaineering school had not prepared him for. First came the swear words and then came the cigarette. All of this was accompanied by a blank look. Not knowing what to do, we emptied our drinking water into the empty car radiator and barely made it to the base of the climb. We'd figure out how to get back after the climb. Gran Paradiso was a spectacular climb. It was not too challenging a mountain to climb, but the last bit to the summit involved a few exposed rock moves that added to the excitement. Being the highest mountain completely within Italy, it provided amazing views. Just as we were getting off the mountain the weather took a turn for the worse. On the way down from Gran Paradiso, it started to rain. We had to find oil and water for Raphael's car in the pouring rain. We hadn't tested our Goretex waterproof clothes against the mountain elements, but we sure were testing them now. Eventually we found oil and water, despite the fact that everything in the Italian alps seemed to be "CHIUSO" (closed) because of rain. We managed to make it back to Chamonix in one piece. I wasn't slaying any dragons yet, but I was certainly fighting some elements. The bad weather that hit the Alps was there to stay. So I took advantage of the bad weather by sitting in one of the cafes, drinking fine French coffee and taking a few telepherique (mountain lift) rides. But after a day's rest, I grew restless and was ready for more action. There was a slight problem--my next goal, Mont Blanc was invisible. No, it hadn't disappeared, but there was an ominously large lenticular cloud covering it. That meant winds could be blowing up to 100 miles an hour. It had also been raining heavily. With a change of plans, Raphael and I found some dry rock to climb close to Chamonix. Les Gaillands and Servoz were excellent rock climbing venues and it was amazing to see the number of small children, out climbing with their parents. Here were the mountaineers of the future, taking their first baby steps up rock walls! The next day I drove to Annecy, another beautiful area with charming canals and a lake. Here too it rained. Was I to be completely shut out? Was I being punished by the dragon up high? I was going to slay this dragon! The next day, I packed my ice axes, with a vengeance, and off we went to climb another mountain--Petit Aiguille Verte--by a technical ice climbing route. Yet another slight technical problem awaited us. The lift was broken. A helicopter had been dispatched to fix it. This was a really big and mean dragon I was fighting. Raphael was as fed up as I was, and he asked if I wanted to drive far. 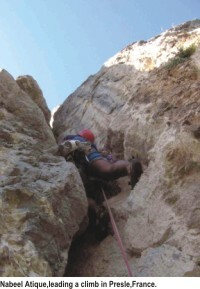 The weather might be good and we might be able to do some rock climbing. So off we went to the south of France in search of blue skies and dry rock. Leaving the dragon behind seemed to do the trick. Clear skies awaited us near Grenoble. Even Raphael's car cooperated. The climbing in Presles - where we climbed - was phenomenal and Raphael was animated as always. He let me lead a section and pointed out that he was doing me a favour. He said "This is a cadeau (gift) to you." Little did he know that this gift was way over my head. I got off route and ended up doing a harder route by accident. I came off the wall a couple of times and yelled "TAKE" as hard as I could because Raphael was out of sight. What's the French word for "TAKE"? Good thing we'd settled upon English as our mode of communication. I made it to the belay station with a mighty struggle and belayed Raphael up. Raphael looked at me from below. He said "Man, you are off route! I asked you to lead the 4+ and you did the 6b." Oops. We rappelled down and got back on route and finished the climb in good form. Needless to say, I received no more gifts from Raphael. However, he had a pack of cigarettes that he bought for both of us. He kept it right in front of me on the dash and said, "I am not going to offer you, but please do not hesitate." I kept it together, hesitated and stayed away from the cigarettes. I didn't need the extra challenge. The dragon was vicious enough! Nabeel Atique is a senior product engineer and adjunct math instructor. 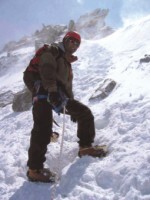 He is an avid climber and has climbed extensively in the Canadian Rockies, Alps, Andes, Africa and the NorthWest Cascades. He lives in the San Francisco Bay Area of California.